How will the health insurance exchange in California look like? The principal is based on a Tier program of insurance plans. 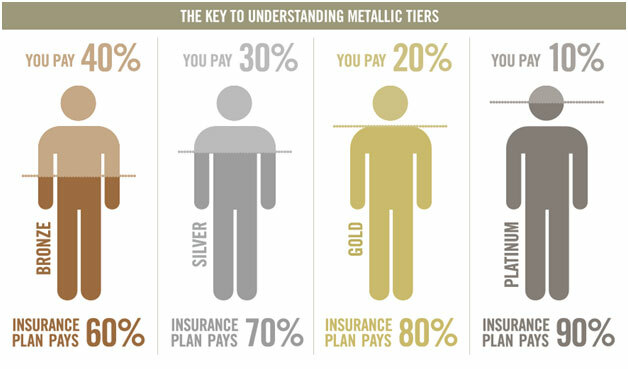 There will be four tiers of insurance, Platinum, Gold, Silver, and Bronze Plans. Insurers who offer the Platinum Plan can charge higher premiums but will pay 90 percent of the cost of benefits covered by the plan. The patient will pay 10 percent until he reaches the limit on his out-of pocket maximum. The Gold plan which will pay 80 percent of the cost of benefits covered by the plan, the patient will pay 20 percent until one reaches the out-of pocket maximum. Accordingly the Silver plan will pay 70 percent, and the Bronze plan will pay 60 percent of the cost of benefit covered by the plan. Patients on the Silver plan will pay 30 percent and Bronze plan holders 40 percent until they reach the out-of pocket maximum. The Silver Tier will serve as the benchmark for tax credits, in form of tax credits or direct governmental payment towards your health insurance premium. Many Americans will qualify for a federal subsidy to pay for their health insurance premium, which depends on their modified annual gross income.